With Batgirl #13, Gail Simone has not only given Barbara Gordon a worthy arch-foe in the form of the vigilante Knightfall - she has proven beyond any doubt that the Barbara Gordon we loved as Oracle still exists. Much of the issue is devoted to an extended fight scene between Babs and her new nemesis. And in what will be a surprise to no one, save those who still somehow illogically insist that Babara Gordon's worth as a character is tied to whether or not she's in a wheelchair, Barbara proves as canny as ever. She uses her wits more than her fists to triumph over her enemies, such as one moment early on in which she plays possum to set up a sneak attack. This issue also sees Simone introducing a surprisingly logical but frightening concept. In the real world, some evidence exists that sentencing juvenile offenders as adults and confining them rather than attempting rehabilitation makes them more likely to commit criminal offenses in the future. Simply put, treating a child like a criminal will cause them to act like a criminal. Simone takes this concept as a truth and takes it to its' logical conclusion within the context of Gotham City, as we discover that Knightfall purposely put herself into Arkham Asylum to learn the ways of the madmen held there. 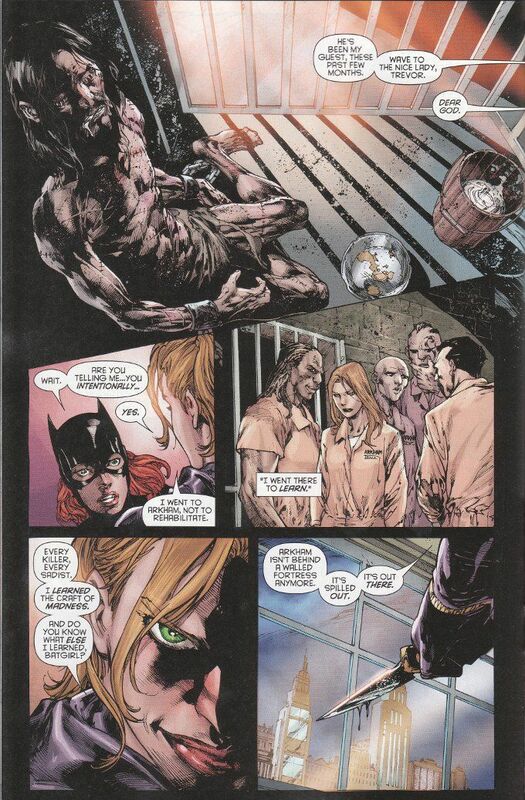 It's long been believed by most Bat-fans that Arkham causes more problems than it solves but the idea of it being a school for criminals is a chilling twist. Perhaps even more chilling than the epilogue in which it appears someone is forming a Batgirl Revenge Society. Ed Benes's artwork looks as amazing as ever. Apart from one bit near the end where Babs is lounging in her underwear and a man's shirt, Benes avoids his usual levels of fan service and even the one pin-up style page that we have does not seem completely exploitative. Praise must also be given to colorist Ulises Arreola, whose colors highlight Benes' pencils and inks in a most fascinating and delightful way. If you're a fan of comics and superheroes, you should be reading Batgirl. It's just that simple.